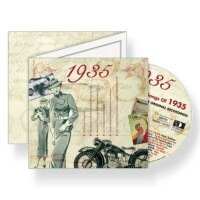 1935 A Time to Remember Greetings Card and 20 track CD. Perhaps the most unusual and treasured gifts around - 20 Original hits from the year 1935, presented on a CD and mounted in a quality 3-part, gate-fold, GiftCard, complete with envelope (GiftCard, CD, and white envelope, are all sent in a protective outer). 1. Fats Waller - Lulu´s Back In Town. 7. Patsy Montana & The Prairie Ramblers - I Want To Be A Cowboy´s Sweetheart. 8. The Jack Hylton Orchestra - You Can´t Do That ´Ere. 16. Fats Waller - When Somebody Thinks You´re Wonderful.